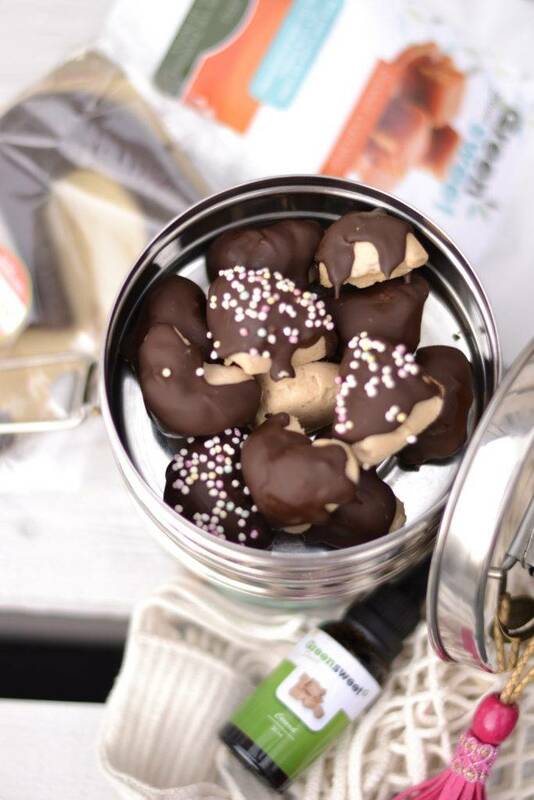 Wauw, a delicious recipe from Manon from Vegan Flavors in which she has processed Greensweet Sweet Caramel and Greensweet Belgian chocolate Pure. possibly some disco dip or nuts for decoration. Grab a mold where you can make the chocolates. Put about 2 teaspoon frosting in the heart and when you have done everything, put it in the freezer. Meanwhile, au-bain-marie melts the chocolate. Place a piece of parchment paper on the counter and put a cake rack on the baking paper. Remove the chocolates from the freezer and push them out of the mold. Place the bonbons on the cake rack. If you want to decorate a dip or nuts with the disco, get it ready and work quickly. Take a teaspoon of chocolate from the pan and pour over 1 bonbon. If necessary, decorate with the disco dip or nuts. The chocolate quickly hardens. Repeat until the chocolate is empty. Place the bonbons in a container and put it in the freezer. If you want to eat a bonbon, take it out of the freezer about 10 minutes in advance. You can also store in the refrigerator.